I've written before about De Beauvoir Town, which is a very pleasant area of Hackney to live in, for lots of reasons, one of them being due to the extensive "Filtered Permeabilty" (roads which have been closed for through motor traffic but remain open to pedestrians and cyclists) which reduces motor traffic across much of the area to a very low level. This creates quieter conditions for residents, streets where children can play along with an added advantage, due to it's location, of a direct & quiet East-West cycle route from Islington to Hackney via London Fields along with the so-called Cycle Superhighway 1 which is a not-as-direct-as-the-A10-but-quieter-than-it route from Shoreditch to Dalston. Towards the end of the 1950's the Victorian terraced houses on Buckingham Road and Tottenham roads were demolished and replaced by the Kingsgate Estate, opening in the early 1960's. Shortly later hundreds of Victorian houses, pubs, shops and about half a dozen streets (almost all land between Downham Road and the canal, bar the industrial buildings surrounding the Kingsland Basin) were swept away to make way for The De Beauvoir Estate. In 1968 plans were then developed to demolish almost all of the rest of De Beauvoir Town with low rise housing estates replacing the Victorian terraced houses. Two newcomers to the area, Stuart Weir (who would go on to become a local labour Councillor for the area) and Robin Young, both journalists on The Times who lived next door to each other on Balls Pond Road, were appalled with the threatened destruction of the community. They decided to do something about it and leafleted the whole area shortly before the council elections in order to hold a meeting with local residents and the ward Councillors in the crypt of St. Peters Church. On the night the Crypt was crammed with around 200 angry local residents and within weeks the De Beauvoir Association was formed with Stuart Weir serving as Chairman. I know that this is what happened in 1968 as it is detailed in an interview with Stuart Weir in issue number 31 of the De Beauvoir Association newsletter, which is archived here, along with over a decade of other issues. These newsletters give a fascinating insight into the early years of the De Beauvoir Association, the politics and struggles behind implementing the road closures, and general activism in the area during the 1970's. "Road plan goes on show"
Most of the closures that were proposed did eventually happen, however the plan was for traffic to be banned from De Beauvoir Square entirely except for Milk Floats, removal vans and emergency vehicles. The plan stated that Pedestrian Ways were to be left through the closures so that you can still "pop round the corner (only more safely)". The closures followed two traffic surveys - the first, a count of all vehicles using local roads (in which residents helped the council); the second, a study of where the vehicles had come from and were going to. They showed that much of the traffic had no business in De Beauvoir. Before these plans were put forward to the council The GIA Residents Steering Committee had argued strongly that De Beauvoir Road and Downham Road should also both be closed. In particular it was felt that De Beauvoir Road cut the "New Town" in half. It is worth noting here that the "De Beauvoir Estate" is never mentioned by name in any of these newsletters; it is always referred to as either "The New Town" or "The New Town Estate" with the rest of De Beauvoir referred to as "The Old Town". The closure of De Beauvoir Road or Downham Road looked unlikely as borough engineers argued that the roads carried too much traffic that couldn't be thrown onto busy main roads and relieved overburdened roads like Englefield and Southgate Roads of traffic they couldn't bear. Planning officers warned that they had tried to close it when they built the De Beauvoir Estate but the ministry of Transport vetoed it. The Greater London Council (which had overall responsibility for traffic in London) also restricted the road closures to the central area GIA. New Town residents argued that commuter traffic was the problem and that their children should not unnecessarily be exposed to risk just to cut a few minutes off a commuters journey. Issue Five of the newsletter was paid for by Hackney Council to try to ensure local residents engaged with the plan and submitted ideas, suggestions and criticisms. It was stressed that the plan were only provisional, not fixed and gave alternative ideas to choose between. To quote the newsletter "We hope parents will take their children along and get them to write their comments too; if they don't, go along by yourselves kids!" An improved quality of life for the Children of De Beauvoir was a large part of these proposals and this was emphasised further on in this issue under the headline "But mum - where CAN we go?" We assume that a broken glass window caused by a boys ballgame on the street begs an apology & replacement of the glass by the boys. Less expected is the apology which the children in De Beauvoir are owed because of the total lack of play facilities. This is how some of them feel. Most people would agree that traffic in Northchurch Road should be severely restricted, if not banned altogether. It is questionable, however, whether adequate thought has been given to the effect of such a closure on the southern area. Downham Road is already both busy & dangerous; the Council has plans for a library & community hall on Downham Road and a workshop for the elderly is being built. Downham Road could link, rather than divide, the two communities. The present proposals for the central area are to be welcomed in that they deal adequately with some of the major problems. No plan will ever please everyone but by confining the proposals to the central area, the Council lays itself open to the charge that it is looking after the interests of the central area residents at the expense of the rest of the Town. In the next meeting to debate the plan local people overwhelmingly voted for the closure of De Beauvoir Road, however most criticism came from people living near the proposed "play areas"
Local children, it seems, swear vociferously, kick footballs everywhere, and can climb even out of 50 ft. deep pits (Obviously Hitler is lucky he did not win the war!) Parents protested back. "What do you want us to do, drug them?" an irate mother shouted. "No, drown 'em" a man called back. A few people suggested reasonably that boys would kick footballs about anyway; it was surely better that they weren't dodging cars at the same time? During 1972 it became clear that the trial road closures would be delayed due to new legislation. Hackney Council also delivered a huge blow to the residents steering committee that they had agreed that De Beauvoir Road would not be closed to through traffic. They also back tracked on the plan to close the road around De Beauvoir Square to make room for play and amenity areas. Now the council officers proposed to keep a 13-16 ft. road around all sides, much to the shock of the committee. THEN THE COUNCIL'S DECISION SHOULD BE OF REAL CONCERN TO YOU. LET'S GET READY TO PROTEST ABOUT IT." 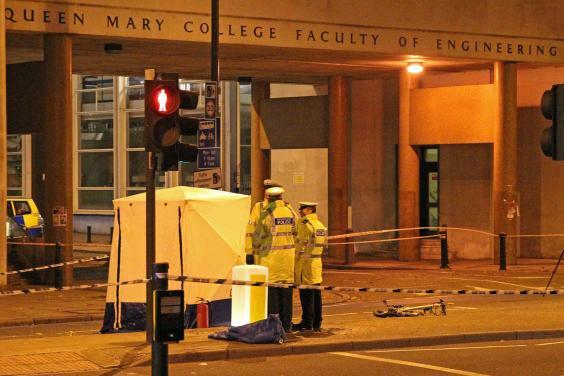 "GLC puts van before lives: Officials took a count of the people trying to cross Southgate road and the traffic. They got the right people count and the right traffic count, for a crossing. However the GLC and police said there wasn't a good case for a zebra crossing as shops could not load or unload goods. They may put traffic refuges in the middle of Southgate Road in a couple of places. Big deal. Give us our crossing. Lots of local residents are already angry as the news travels." 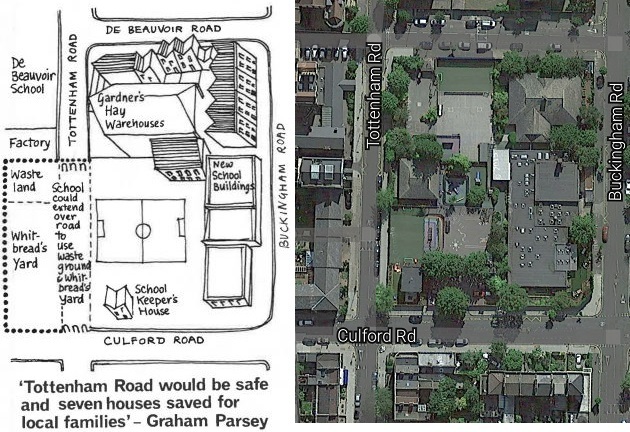 "Extend School onto road - and shut out traffic"
The GLC and the Inner London Education authority were seeking to extend RC Kingsgate Junior and Infants school by compulsory purchasing seven houses next door to it along with Gardener's warehouse (a hay merchant for any horses still knocking about). However the association argued that it made more sense to extend the school over Tottenham Road and onto derelict land opposite it, saving the houses and bringing the added benefit of closing Tottenham Road to through traffic. There was strong backing locally for the closure of Tottenham Road, which was used by through traffic as a notoriously dangerous slip road alternative to Balls Pond Road. The parents and staff of the De Beauvoir School had expressed their concern, and Hackney Council had been willing to agree to the road closure. "The first demonstration was on the Monday and this was a great success. The drivers did not know what had happened and this came as a surprise to them. When doing this make sure it is the busiest time of the day, and do it unexpected as the police and bus officials will divert the traffic. Never let them know too soon or else you are left without any traffic. "How many more deaths before we get a crossing?" The second time we stopped the traffic we let the police know too early, so they diverted the buses and traffic. So that made up our minds not to inform the police until we were ready to walk in the road. With banners and Terry Hemmstead, our leader, we blocked Kingsbury Road stopping the traffic going into Balls Pond Road. Make sure you have plenty of banners and make sure you have all the parents behind you. Never get stroppy with police, or else you won't get anything. The third one was a success - police officials, traffic officials and council officials came down. Our leader and me knew we had them worried; Terry Hemmstead told them we would be willing to have a meeting in Kerridge Court after we had finished the demonstration. The officials said they would promise to bring it up in the next meeting. Mr Hemmstead was speaking for all the mothers when he said, "We are not interested in talking or promises. We all want action and nothing else". Hackney Council put up a temporary island which helped a lot - this was after three or four demonstrations. And thanks to Terry Hempstead and all the mothers and fathers we have got our lights"
Initially the council used a formula to determine if a road needed a crossing although, quite unbelievably, any children aged under twelve were not counted when working out this formula as "they were not thought responsible enough to use a crossing properly"! What is striking about these demonstrations in the early 1970's is that similar demonstrations were taking place at the same time in the Netherlands. 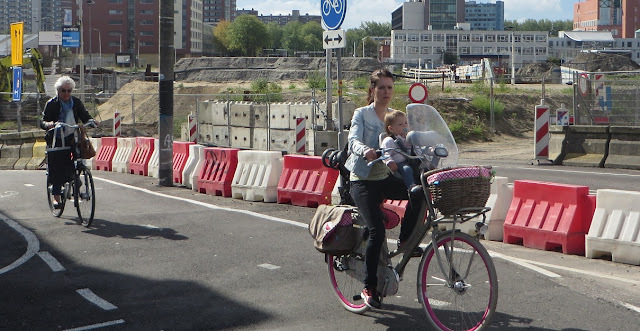 This fascinating post by Mark Wagunbuur is worth reading if you haven't already, featuring children and parents fighting for roads to be closed to motor traffic in the Amsterdam suburb of "De Pijp" in 1972. Also the accompanying edited and subtitled video of the documentary which inspired the post is well worth taking ten minutes out of your day to watch. De Pijp is a very different area today, thanks in part to these demonstrations in the early 1970's, just as the rest of the Netherlands is very different today than it was in the early 1970's after Dutch authorities deliberately turned their attention away from demolishing areas of their cities to make space for cars and instead turning them back into safe places for people. 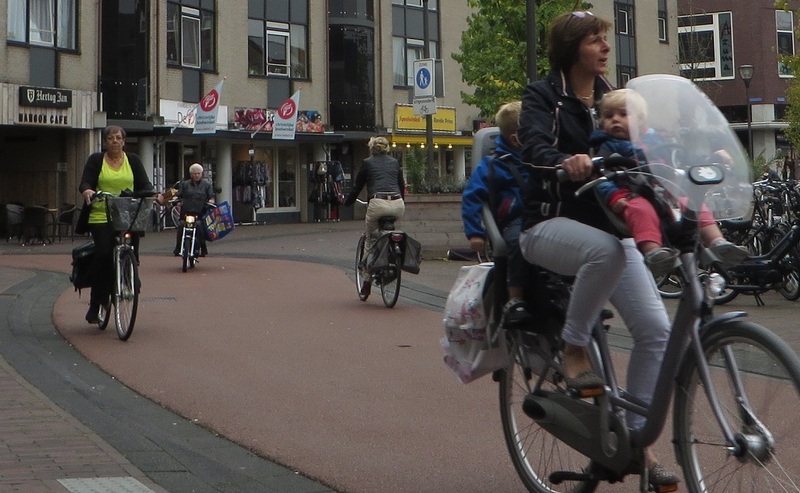 This did not happen by accident and it took a long period of campaigning to turn the Netherlands into the people and bicycle friendly country it is today. This all started with parents blocking roads to campaign to make their streets safer for their children in the Early 1970's, just as the parents of children in Hackney were doing at the exact same time. December 1973 and the newsletter reported that it was looking likely that the much-delayed temporary road closures in the central area of De Beauvoir would be introduced by the end of January 1974. The play area in De Beauvoir Square was to have been in the roadway near the houses but a new plan removes the play area (and the kids with it) to the centre of the square. A few people on the residents steering committee would like to see the all the play facilities planned for Northchurch Road transferred to the Square. But if the play areas are removed from Northchurch Road, much of the case for closing the road to through traffic is removed too. One thing is certain; the majority of De Beauvoir residents who live outside the central area won't be prepared to suffer from the extra traffic and parking which will result from the road closures unless facilities are provided in the traffic free areas created. The experimental, temporary road closures finally went in place on the morning of Monday, April 8th 1974. Two months later and Issue 16 of the newsletter showed that not everyone was happy. "Road Closures: New Town 'cut off and abandoned'. Militant mums demand action now"
New Town tenants are in a militant mood over the experimental road closures and a Tenants' Action Group, headed by Emilie Chalk, has been formed to make their voices heard above the roar of traffic thundering along Downham Road. 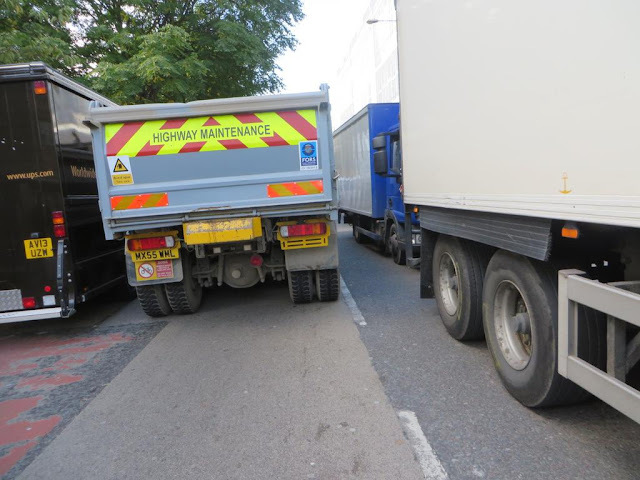 As we were going to press, the action group announced plans for demos on June 13 and June 14 to block De Beauvoir Road and Downham Road at the crossroads. They feel cut off and abandoned and want Downham and De Beauvoir Roads closed before a child dies. If the council do not agree they demand that Northchurch, Hertford and Enfield Roads are reopened to through traffic. Backed by worried mothers, Mrs Chalk of Trinity Court, has been collecting thousands of signatures for a petition protesting that the closures have made some roads more dangerous than ever for their children. Soon after the road barriers went up, Wally Richmond, a blind tenant was nearly killed twice when frustrated motorists squeezed past barriers over the pavement. He was one of the people who demanded action at a stormy public meeting in the community hall. DBA chairman Graham Parsley warned that this was turning into an "Old Town vs New Town battle" and was just what the GLC wanted. "We must fight together. If the pressure is built up then we can get something done when the six months (of experimental closures) is up." "We can't wait six months." 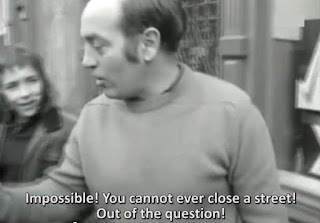 "Take the barricades down now!" "All these committees are no good. We'll close roads ourselves and chop down the barriers"
People who are against play areas outside their homes want the best of all possible worlds. They already live in the best houses in the best roads in the area. Now - after many years hard work by members of the Residents advisory committee and the councils officers they are to benefit from a traffic scheme which will keep through traffic away from their doors. But instead of being delighted they now want the whole scheme abandoned in favour of a watered-down alternative which will make their own roads more attractive than ever, but without providing anything for the community in return. Naturally there is a strong argument against the proposed play areas on aesthetic grounds (wouldn't we all like our own streets to be closed, paved and tree-lined!) but in my view this is over ridden by the need for community play and amenity space. If it can be proved that no such need exists, would they be prepared to see the whole scheme dropped in favour of a traffic scheme based on the closure of Downham Road? Such a scheme (which could provide a linear park for the benefit of both the old and new towns) would make good sense. But it could mean a cement mixer along Northchurch Road every few minutes. The residents must sort out their priorities. From the critical reaction there has been to the experimental road closures from many people outside the 'closed' area and from the New Town, it would seem that any further discussion about weather or not designated play areas are to be provided at the Northchurch Road intersection is now irrelevant. It is clear that residents living outside the 'closed' areas will not continue to suffer from extra heavy traffic unless the closed roads are put to community use. If they are not to be used, the closures must be transferred to areas where community use will be welcome. My wife and I have now had the opportunity to enjoy living in this area after such a long period of excessive traffic noise which until now had been a constant disturbance. It is our opinion that the proposed changes to this area will vastly improve the local environment. More is the pity that such changes were not possible earlier. The idea of play areas must surely be welcome to those families with small children who cannot for so many reasons find the time to go the distance to suitable recreation places for young children. And who would deny the opportunity to those that are less fortunate and have no space at all. We feel that the authorities have a duty to the New Town especially and everything possible and within reason should be done to make provision for them and the various age groups to cater for their interests. The trouble caused by some young persons is very likely due to the lack of facilities to release their energy into something more constructive. The only complaint printed about the inconvenience the closures brought for those driving in the area was from Dr. Ashan of Southgate Road "The closures are costing us time and money and of course it is causing us a lot of worry. It disturbs us that the closures seem to have been the wish of a few rather than the Majority." There were also complaints from some residents that "Those bloody buses are shaking my house to pieces" referring to the 10 buses per hour (or as many as 20 per hour on Saturday afternoons} which had been re-routed through De Beauvoir Road and Downham Road to complete a 'turnround' which used to be made through St. Peter's Way, the South Eastern corner of De Beauvoir Square and the bottom of Hertford Road before the road closures. Astonishing today to think that such a quiet and tranquil place such as De Beauvoir Square once had up to 20 buses an hour using this section as a turnaround, along with all the other through motor traffic. "Crucial roads vote on Wednesday"
During the first nine months of the experimental road closures the accident toll on the road affected fell by 37%. This represents a saving to the community of approx £32,500. In Downham Road accidents fell from 10 in the previous nine months to three after the closures. On De Beavoir Road the drop was from five to four. 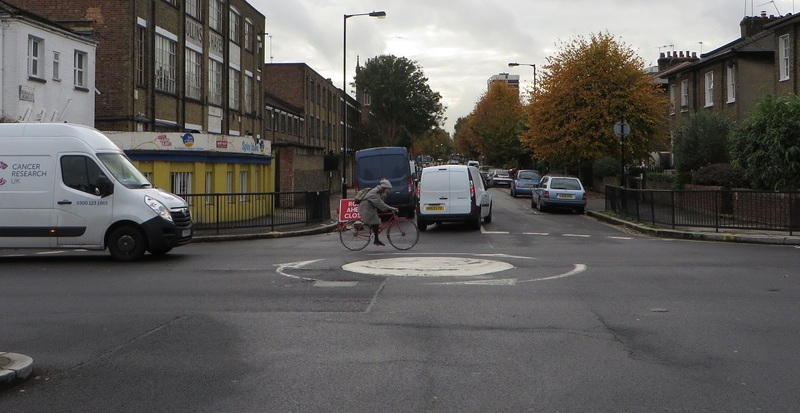 In Northchurch Road, previously with a bad accident record, there were none. In 1972 the council approved the plan with only one vote against the principle of road closures. In 1975 the situation is different, and it seems likely that some votes may be cast against the permanent road closures. Objectors to the scheme say all the benefits are for the Old Town residents, mainly at the expense of the New Town. The main purpose of the scheme is to create open space and play areas in a part of Hackney severely deprived of them, from which all residents of De Beauvoir will benefit. People outside the area may be aware of the 800 strong petition against the road closures but may not know the signatories were led to believe they were petitioning for something quite different - the closure of Downham Road and De Beauvoir Road, something the council has always refused to consider. That same month Hackney Council voted to make the road closures permanent by 29 votes to 17. The main opponent to the scheme was Councillor Bob Hasters who said that "one person's traffic free area is another person's traffic problem". He and several other councillors claimed that traffic had increased in their areas since the closures. Councillor Eileen Cox said that the road closures were necessary to provide two acres of much-needed play space with no housing loss and that the closures had already cut down accidents throughout De Beauvoir by more than a third. She ended by arguing that "people were more important than cars" receiving warm applause as a result. Councillor Alf Linzell argued that the scheme was not just for one privileged area, but should be the first of many other schemes. He stated that these traffic-free areas were needed to make Hackney a more pleasurable borough to live in. The facts are clear: Hackney has the lowest average incomes in London, one adult male in four unemployed, one in five dwellings unfit, the people living there express greater dissatisfaction with their area than people living anywhere else in the country, children achieve the worst educational results in Inner London, and so the list goes on. The Department of the Environment recently classified Hackney as the most deprived local authority in England. Paul Harrison - De Beauvoir newsletter, March 1984 in response to criticism of his book Inside the inner City. The De Beauvoir association, which had achieved so much in its lifetime ceased to exist until it was reformed in 2004. With its closure the play areas were never built. The bollards, which were only intended to be temporary and were to be replaced by seating and trees, remain there to this day. New Town residents who voted for the scheme in 1975 would probably be furious to see that what they had expected to become play areas for their children are now areas that are mostly used by cycling commuters from outside the area, bar some local kids kicking a football about away from the threat of motor traffic. 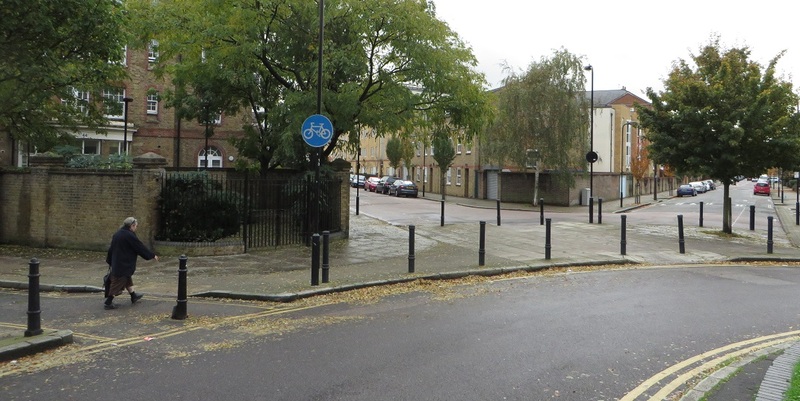 The residents in the Central area of De Beauvoir now live on quiet streets and many people who choose to cycle in Hackney have a pleasant and safe East-West route to use in the West of the Borough. This was never the intention but I believe these closures did do much to benefit many Hackney residents from outside the area. It is a shame that this was not duplicated on a much larger scale across Hackney or Inner London. The DBA was non-party political right from the start, and its membership was a political cross-section in the same way that our meetings always showed a cross-section of tenants, leaseholders and owner occupiers. I think one important thing was that we took care to set up an Association which was broadly based and stayed alive to new needs and new issues through the informal open committee idea. We carried out opinion surveys to find out what people really wanted to happen to the area, and the success of the association can be measured by the fact that as many as 75 to 80 per ' cent said they were aware of the DBA and what it stood for. We organised an advice centre, every Saturday, to help residents with their problems and to take up cases. We organised stunts, we got tenants together to demand repairs from their landlords, we tackled the GLC about extending the Conservation Area, we got the Victorian Society and John Betjemam to take an interest in the area. We started a playgroup, we carried out a survey of Welfare rights with the council. 'We tried to find out what people thought and what they wanted for their community. We were never just concerned with conservation and the environment - that would have been disastrous. Whilst all the of closures from 1975 are located in the Central area, between Downham Road and Englefield Road, these new closures are located in the northern area, between Englefield Road and Balls Pond Road. TFL also launched another consultation earlier this year to close Stamford Road and Tottenham Road where they both meet at the A10. This consultation wasn't launched to create "play areas" for local children, or even to make routes safer for cyclists. This consultation is about "improving the traffic flow" on the A10 by moving the loading bay from its current location outside Tesco to where these two roads currently meet, in the hope this will reduce the queue of buses that often builds up whilst Tesco lorries unload. 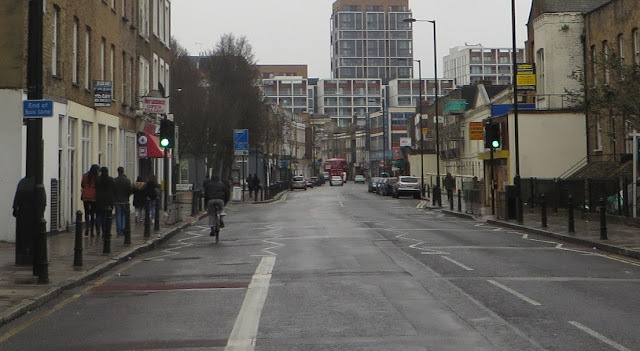 The added advantage is less traffic making it's way to the A10 south of Dalston Junction thereby relieving the traffic lights that exist due to the ridiculous waste of money that is Dalston Junction Bus station. If these two consultations go ahead as planned then that means all through motor traffic will be completely eliminated in the northern section of De Beauvoir Town . There will be no way to travel to travel East-West between Southgate Road and the A10 or North-South between Englefield Road and Balls Pond Road unless you're on a bicycle or on foot. Interestingly as part of this consultation De Beauvoir Road is also set to be closed just South of Englefield Road, meaning that the only route that it has been possible to travel through the central section of De Beauvoir Town in a motor vehicle since 1975 is now also set to be closed. The same De Beauvoir Road that the council spent so long blocking from being closed in the early 1970's. However the southern section of De Beauvoir Road which cuts through the centre of the De Beauvoir Estate (or the not-so-new-anymore-Town) remains open to through traffic, as does Downham Road. The residents of the southern district of De Beauvoir have been let down again, consistently gaining nothing from these schemes for over 40 years. I'm sure if these consultations had been proposed back in the mid 1970's they'd have been blockades of both roads in protest. Although TFL describe this as a "cycling" consultation that is only because it is coming out of the money pot for the cycle superhighways program after TFL wrongly decided to build CS1 along back streets rather than on the more direct, and more dangerous, A10. This scheme is about improving neighbourhoods for all residents by keeping out rat running traffic from outside the area. 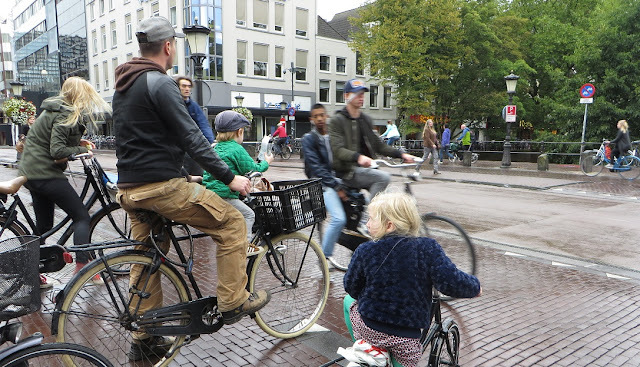 It should not be about "cyclists", if anything it should be about making the roads safer for children, just as the Dutch mothers campaigned for in the 1970's and British mothers also did on Balls Pond Road at the same time. Please respond to this consultation by November 16th and say yes to the closures in order to improve the area for all. Then once you've done that please then campaign to close De Beauvoir Road at Whitmore Bridge, as should have been done in the 1970's. Then ask for filters along the awful car dominated rat run that is Pitfield "cycle superhighway" Street. 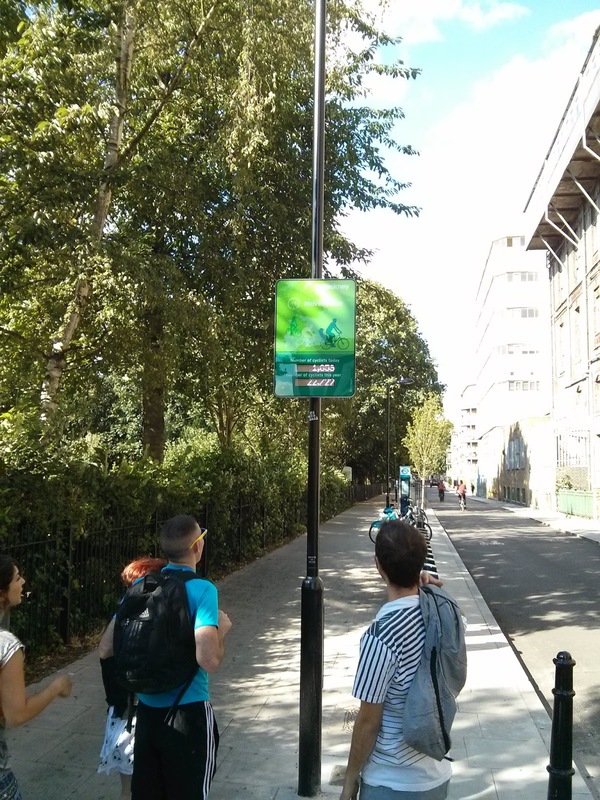 Then help campaign for similar closures in London Fields. Then ensure you campaign for the next mayor to build cycle tracks on the remainder of the TFL road network (including the A10) so they are safe enough for children to use. If they say no then get your neighbours together and start protesting until they do. And always remember this is about children and giving them safe space to play, cycle and more freedom; it's not about cyclists. Goldsmith's Row runs from just South of the Cat & Mutton Bridge over the Regents Canal to the junction with Hackney Road. It is part of London Cycle Network Route 9 and is a highly used cycle route for people travelling from Hackney Central or Waltham Forest and beyond into Central London as it joins up with the cycle path through London Fields via Broadway Market and continues onto Hackney Town Hall via the partially filtered Martello Street and the bicycle only Hackney Grove via the Richmond Road Crossing. Although it is now often referred to as a cycle route it has been a well used route for centuries, and was formally called the "Black Path" or the "Market Porters Route" as this was where farmers would walk their livestock into the City of London back when London Fields really was just fields and Hackney was a small farming village on the outskirts of the City. This map from nearly 200 years ago gives you a good idea of the route they would have taken via Bird Cage Walk (now Columbia Road) and on through Shoreditch to Smithfield meat market in Farringdon. A few months ago I asked Hackney Council for a list of daily counts here since it was installed, they duly obliged but I have only now got round to doing anything with the figures. I've worked out the average number of cycle trips each weekday for each month since August 2013, along with the average number of cycle trips per day at the weekend, as these are always significantly lower (presumably due to the large number of commuters using the route during the week). I've also worked out the average number of cycle trips each week (Monday to Sunday) for each month and then added the total number of cycle trips that took place in each month (minus August 2013 and April 2015 which I don't have the full set of figures for). Note that I've counted these as the total number of "cycle trips", not the number of "cyclists" as often these will be the same person twice going to and from work, the pub, etc. 2014 is, obviously, the only calendar year where a full set of figures is available but with figures for the end of 2013 and the beginning of 2015 it gives quite a good picture of cycling figures across the year along this road. The average number of cycle trips is at just over 4,000 for August and September 2013, dipping below 4,000 in October and November and then down to just over 2,000 in December. Into 2014 it then rises above 3,000 in January and February, reaching nearly 4,000 from March to May and then hits over 4,500 in June and July before dipping down to under 4,000 in August, rising back above 4,500 in September and then following a similar patter of the year before to the end of 2014. The figures for 2015 are similar to the previous two years averaging between 3,000-4,000 cycle trips per weekday. The average number of cycle trips per week unsurprisingly follows a similar pattern to the average per day but is always between 20,000 and 30,000 except for January 2014 and February 2015 where they dip just below 20,000 and both Decembers when they both dip below 15,000. And then monthly totals also follow the same pattern of being higher in the summer and lower in the winter. July 2014 is the highest figure here when nearly 130,000 cycle trips were made with December 2013 the lowest with just over 65,000 trips, the only month where the total number of cycle trips was below 70,000. In 2014, the only year with a full set of figures, the total number of trips was always above 100,000 a month from March to October and always below it from November to February. Of the ten lowest daily totals it'll probably come as little surprise that Christmas Day, Boxing Day and New Years' Day all feature in the five lowest daily totals but I was also surprised to see a date in August there; Monday the 25th 2014, which was the date of the Summer Bank holiday. I also count myself as two of the cycle trips on Christmas day in both 2013 and 2014. As for the ten highest daily totals Tuesday the 3rd of June 2014 is listed as the highest at 6,624 trips but this is significantly higher than any other day and the only time when more than 6,000 cycle trips have been counted in one day. I initially searched for any events that may have been happening that day, such as a bus strike, or exceptionally hot weather but could find nothing. It was the Hackney bike workshop alongside in Hackney City Farm that day but that happens twice per month so shouldn't skew the figures by that much. I then saw that the Hackney Cycling conference took place just four days later so thought perhaps there may have been some local rides by councillors, cycling activists or highway engineers to view cycle infrastructure in the local area that may have contributed to the sudden rise. However I then noticed that the previous day, Monday 2nd June there were only 2,559 trips which is also exceptionally low for a weekday in June so have therefore concluded that this is an error with the counting software and some of the cycle trips from Monday were mistakenly counted on the Tuesday instead and Goldsmith's Row has still not seen over 6,000 trips in one day. Or I could be wrong of course and those two days are exceptional for no particular reason. From September 2014 to March 2015 we're also able to have year-on-year comparisons and can see that the total number of cycle trips per month increased in four of those months but decreased in three of them. However these are fairly small numbers so there hasn't really been any real significant increase or decrease in people cycling along here so far as I can see. At the end of next Summer I'll probably approach the council again for more up to date figures and if they oblige then we'll have three full years' worth of data which should give a much clearer indication of any significant changes in cycling numbers. I can't really see how the number of people choosing to cycle here can increase significantly as whilst Goldsmith's Row is a lovely route to cycle along any serene cycling conditions simply end at Hackney Road when you're suddenly thrown into some of he worst cycling conditions possible in London, which I've written about before and continue to bang on about. 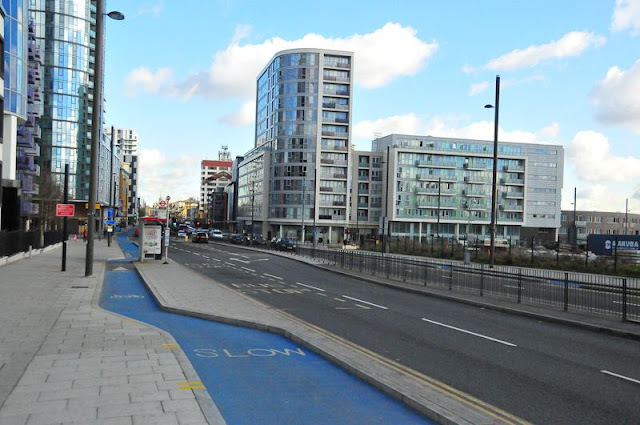 There is a nice two way cycle track to the North of Hackney Road but it only runs for about the length of a swimming pool and links Goldsmith's Row up with Columbia Road so is no use if you're travelling along Hackney Road from Shoreditch to Cambridge Heath. Quite unbelievably in the draft "vision for Hackney" document for this area found on the Hackney cycling campaign website the call is for this cycle track to be removed and the land given over to Hackney City Farm! Now I'm a big fan of Hackney City Farm and am there often, either there with my daughter mostly watching the pigs sleep or enjoying the food in the cafe, but it is insane to remove the only section of traffic free cycling from Hackney Road, turn it into #space4chickens and force people into cycling in primary position in front of lorries. Any measures like this will certainly not increase the amount of people cycling on Goldsmith's Row. The correct answer of what to do with this valuable piece of land is, of course, to use it for building cycle tracks on both sides of Hackney Road, with bus stop bypasses, as part of a plan to install segregated cycle lanes along the entire length of Hackney Road as loosely promised by Hackney Council last year. However I'm sick of waiting for this so I'll be switching my commute to Tower Hamlets and CS2 when it is finished next year, a longer but safer cycle route to work as I simply cannot stand ten more years of mixing it with lorries on Hackney Road. It's been a couple of weeks since I returned to the UK from my cycling trip in the Netherlands. This was my seventh trip there but only the third time I'd visited the country on my bike. On both of those two previous cycling trips I cycled directly from Hook Van Holland to Amsterdam along the North Sea cycle route and then cycled back along almost the same route again after a few days. Whilst those were both fantastic holidays and the first trip completely changed my outlook on how cycling could and should be accommodated I wanted to go back to visit other areas of the Netherlands I hadn't been to before and use more of the wonderful Dutch cycling infrastructure, particularly within urban areas. It's a great feeling cycling off the ferry and onto a smooth and wide segregated cycle track directly outside the ferry port. No matter which route you then choose to take it seems it'll always be a safe and comfortable route to cycle, no matter what your age or ability. After a few hours of always being accommodated extensively through urban and rural areas it really does feel like you've stepped onto another planet where cyclists are treated as equals to motorists. By using a combination of cycle tracks, bicycle roads and roads filtered to carry only very low numbers of motor vehicles it seems that anyone can easily get around the country by bike and it was a pleasure to see that wherever I cycled people of all ages were also cycling. As well as the extensive, well designed and continuous cycle routes I enjoyed experiencing the joined up infrastructure network, such as cycle parking at railway stations. Although I've seen examples of this online before the sheer scale of some of the Cycle parking totally blew me away. Here is a video I shot of the 5,000 capacity cycle parking in the beautifully recently reconstructed Delft station.Visiting Delft was a last minute decision and I'm very glad I decided to detour. 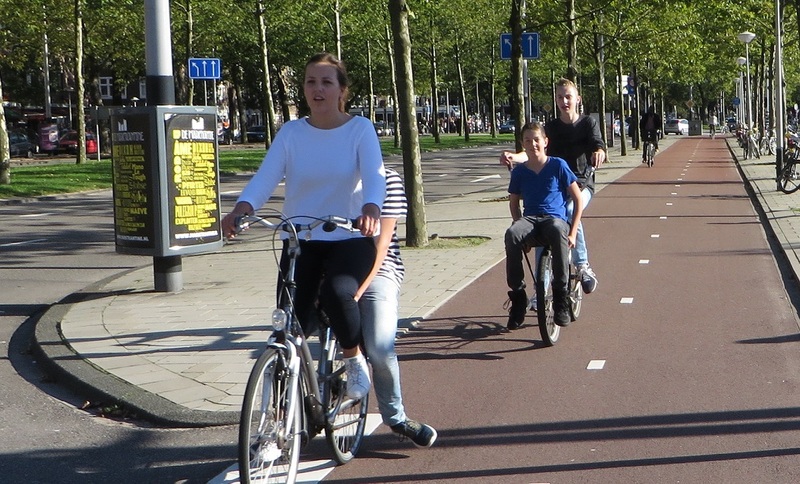 If you're a regular reader of the excellent Bicycle Dutch blog (and if you're not I highly recommend you become one) then you'll know that the Dutch have spent vast sums of money in recent years carrying out large infrastructure projects aimed at making their cities more people friendly. In Delft they've built 1.5 mile long tunnels under the city in order to remove the elevated railway tracks through the centre of the city and route the trains under the city. The railway viaducts are currently being torn down, removing physical barriers for people travelling across the city as well as improving noise for residents and the overall visual layout of the city. The area around the railway station is currently a building site not too dissimilar to the building site at Victoria station in Central London. 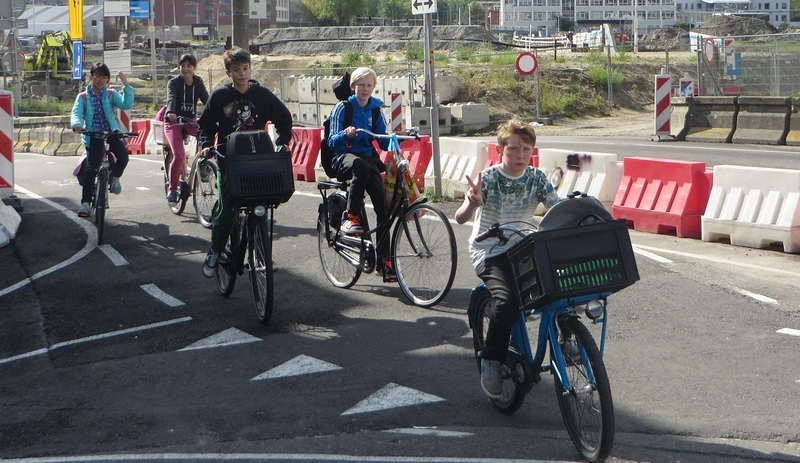 However in Delft cyclists are not expected to cycle among heavy construction traffic but are, of course, provided with safe cycle routes all around and through the construction area and a lot of work had clearly gone into creating this. 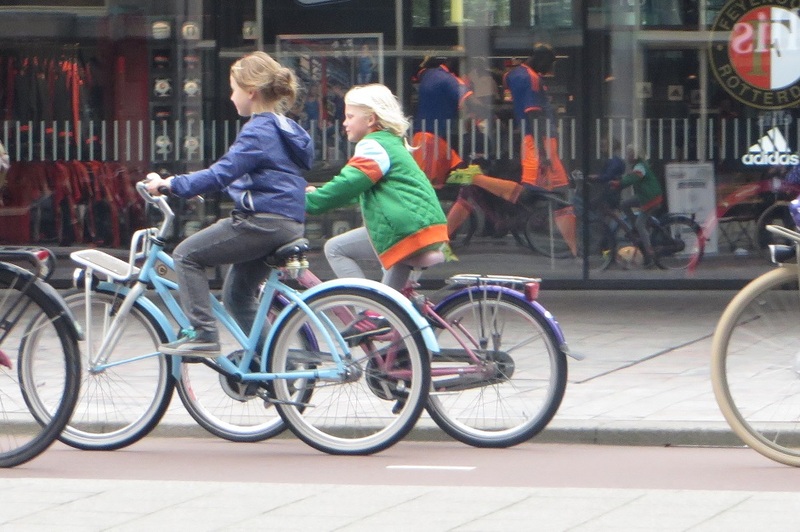 One thing that always initially surprises me when I arrive in the Netherlands, but soon get very used to, is the huge amount of children cycling everywhere. 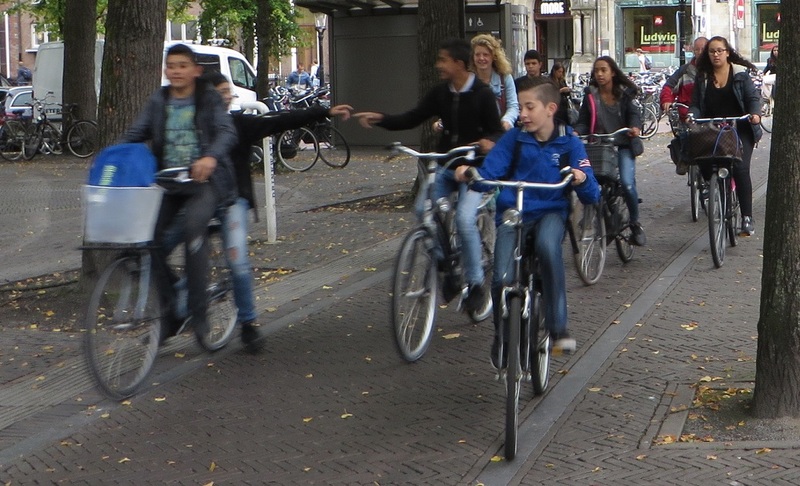 Some are also of a very young age and often unaccompanied by adults, either cycling alone or with groups of friends. It is a wonderful thing to see especially during the school run which I was caught up in on several occasions. From late afternoon there was always a constant stream of children cycling wherever I was; in rural areas, in suburbs and also on the main roads in the centres of the town and cities I visited. This continued long after the school run with children coming and going in the evening by bike, quite often in large groups and it was wonderful to see the freedom so many Dutch children have compared to British children in many of the car dominated cities of the UK. Once back in London it then started to initially feel strange to not see children cycling on the roads, although after cycling to work on the first day back it became quite clear why so few of them do. I described it on twitter as like coming back to a third world country but on reflection I was being far too kind. The main roads in London are horrific places to ride a bike and are choked with lorries, buses and heavy traffic all day long. I was sat in a bar on one of the main streets in the centre of Utrecht with Mark Wagenbuur watching people cycle past as a girl, who was probably no older than ten years old, cycled past on her own I stated that a) a girl of that age would not be seen cycling on an equivalent road in London and that b) if a girl of that age was to cycle alone on a main road in Central London then it would attract some sharp comments about how unsafe it was. He just looked at me and said "well, that is because it wouldn't be safe for her." And he was absolutely spot on; it is dangerous to cycle on the main roads in London and we should not be encouraging children to do this. A picture I took whilst cycling along Hackney Road, shortly after arriving back in the UK. Sharing the same road space as lorries on the main roads and then training and encouraging children to cycle on these roads is total madness. Cycling should be an accessible activity for everyone and not just for the brave few, willing to be trained in survival techniques. Pedestrians were, on the whole, also well catered for both due to the large amount of either traffic-free or low-traffic routes in the city centres and the discouraging of through motor traffic in residential areas. Generous pedestrian crossings were provided at junctions and almost all side roads seemed to have continuous pavements. On many roads the cycle tracks made the space for motor vehicles much narrower than you would have here in the UK so tended to slow the traffic down and also the tracks and buffer between the tracks and the roadway pushed cars further away from the pavement making many streets much more pleasant for walking. Conditions were also, on the whole, a vast improvement for disabled people than a lot of streets here is the UK as there were much quicker and safer ways of getting around the towns and cities. 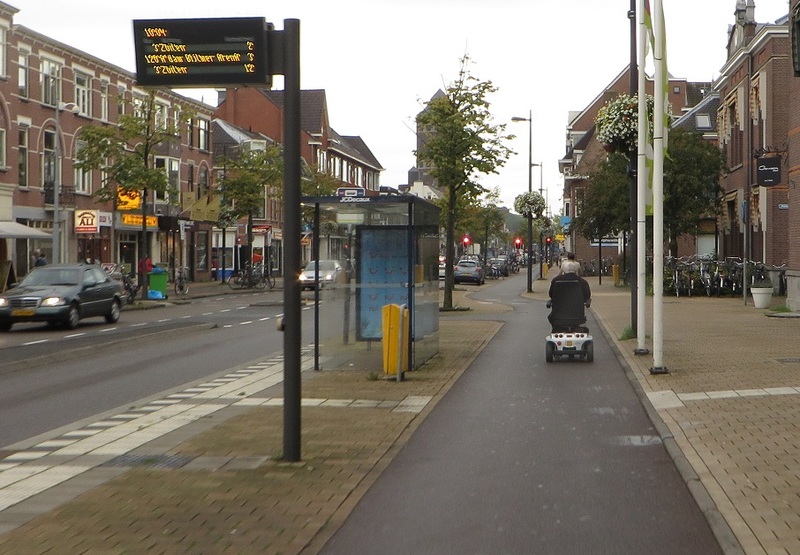 I saw lots of wheelchairs and mobility scooters and all of them were making use of the cycle infrastructure. The removal of large amounts of motor traffic from the centre of towns and cities make them feel much calmer and more civilised places to be. I visited Houten one morning where it really did feel as though I was visiting a film set as bicycles and people talking were the only sounds I could hear in the very centre of the town. This was the same case in Gouda and also in many areas of Utrecht. 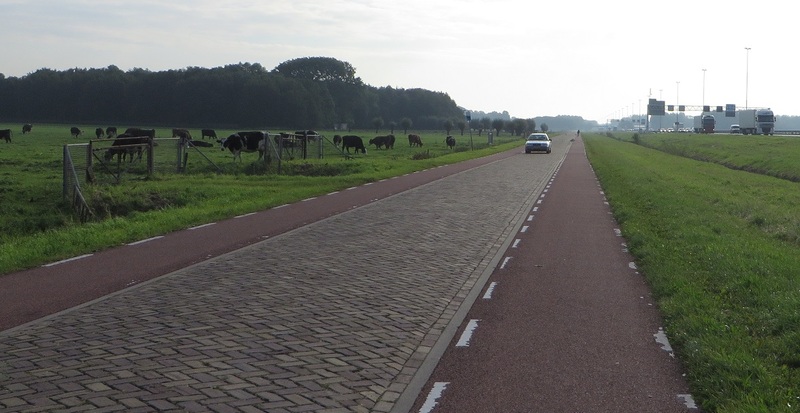 Something that isn't mentioned often enough and that is how fast cycling is in the Netherlands. Not just on the designated "fast" routes in rural areas between cities but also in the cities themselves. On Monday morning between 08:00 and 09:00 I took photos of people cycling in the rush hour in Amsterdam at Haarlemmerplein, Mr. Visserplein and at the cycle track that runs through the Rijksmuseum. I was stunned at just how quickly I was able to cycle from one side of the city to the other at such a busy time, so much quicker than the equivalent distance in London where I would have been held up, stuck behind congested motor traffic. Monday morning rush hour in Amsterdam was a joy to be part of, watching parents and children cycling side by side having a chat, nursery school children sat on their parents bike eating breakfast, groups of friends cycling to school together; all doing so without the stress and worry of interacting with motor traffic. As I cycled along Weesperstraat shortly before 09:00 on my way to the Rijksmuseum a van driver within the heavy traffic was having an awful road rage fit and beeping his horn at other motor vehicles. He then pulled some ridiculous undertake that pushed him about two cars further up and returned to beeping and shouting at no one in particular, within his van. No one else cycling around me seemed to even notice and I started to think about what if you transported that idiot to the Shoreditch Triangle and what an unpleasant and dangerous environment that would make for people cycling in the area. Despite all the talk of strict liability I saw an awful lot of really bad driving like this in my time in the Netherlands but it was always "over there" on the road. I was sharing some videos of people cycling on twitter it was a bit disappointing to get comments back about people not wearing helmets, which is just an utterly ridiculous statement to hear when you're cycling in the Netherlands. 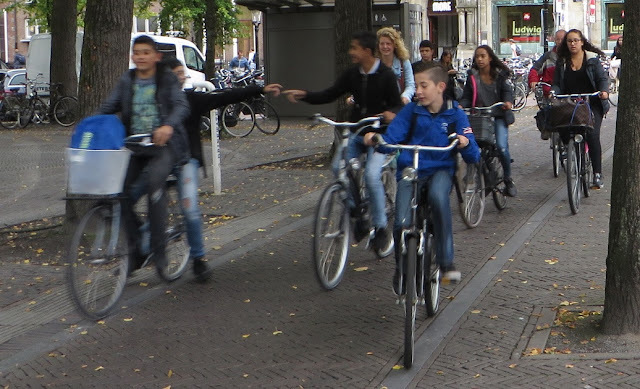 These are streets where people cycle in their thousands all day long, including many, many young children and serious head injuries are not a concern at all. It is a non issue. This is exactly what cycling should be like; we're the abnormal ones for strapping helmets and high viz on like we're about to enter a war zone just to get to work. I found it pretty depressing to be back in London after getting so used to being able to safely cycle anywhere I wanted in complete comfort. I had to pick my daughter up from nursery on my first day back and after picking her up we travelled along Pitfield Street and Whitmore Road through the resurfacing works on Cycle Superhighway 1 (where Hackney Council and TFL bizarrely think resurfacing a road, narrowing it, making it two way and not reducing any of the huge amount of motor traffic that uses it makes it a "cycle route"!) CS1 is far too dangerous for me to cycle with my three year old so like most parents and children I cycled along the pavement here in order to get to the Regents Canal where I could safely cycle back to Hackney Wick via Victoria Park, knowing that this route will be closed by 4.15pm within a month. I started to feel sad, jealous and angry thinking back to where I had been just 24 hours earlier and how I could have safely cycled with my daughter wherever I wanted to go, at any time. Instead I'll have to spend the next few months paying money after dark in order to spend at least twice as long (on a good day) stuck on the bus or a densely packed overground train to get my daughter home safely. The scene on Mile End Road on the old non segregated CS2 after Brian Holt's death less than two years ago. People cycling will no longer have to share the same space as lorries here, hugely improving the safety of cycling on the A11. All TFL roads need well designed cycle tracks. People will continue to die whilst cycling in London and it will always remain a minority mode of transport unless we stop the silly notion that training or encouragement will make any difference at all and instead just copy what is proven to work. 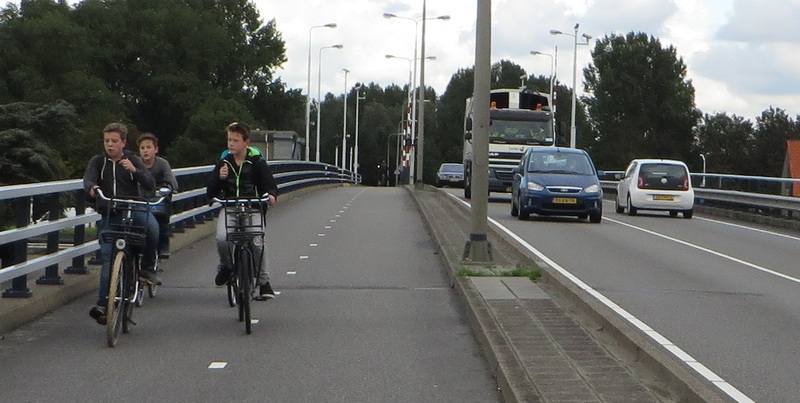 Cycling in the Netherlands was not perfect, there was some badly designed cycle infrastructure and also some very busy roads that had no provision for people cycling at all. However this was rare and I felt that I would have been perfectly happy to cycle with my daughter almost everywhere I went. 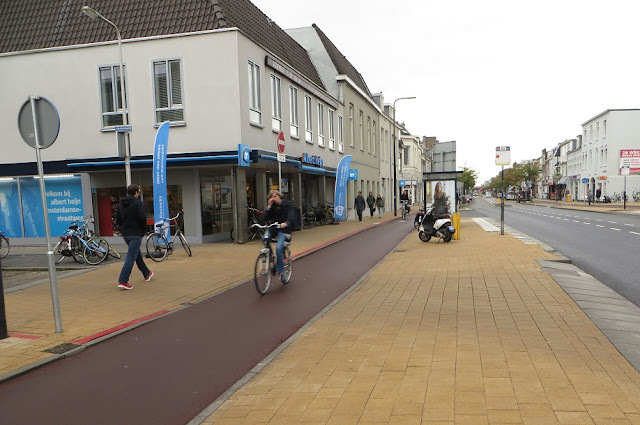 It can be quite difficult to sufficiently describe what cycling is like in the Netherlands in a blog post, it really is something that has to be experienced so I would recommend that you take the ferry from Harwich with your bike and ride around for a few days, just as I did. The main towns and cities are only a couple of hours ride away from each other and I spent the whole week cycling in jeans, a hoodie and trainers on a heavy Dutch bike. David Hembrow also runs study tours in the north of the country, and although I've not attended one I hope to one day. 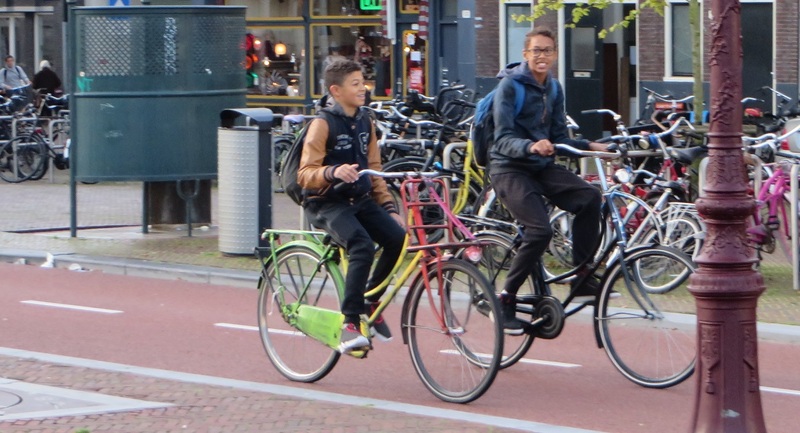 I find it odd when people credit the high cycling rate in the Netherlands to being down to "culture". 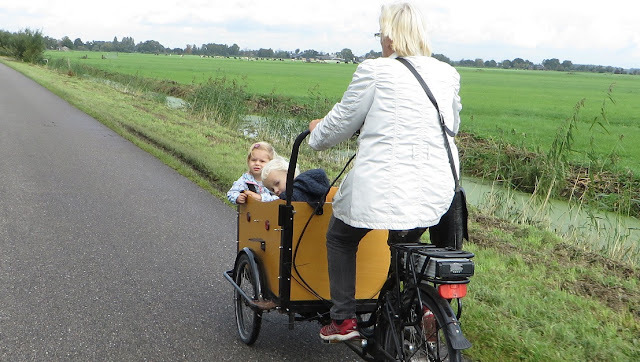 There is, of course, an element of cycling culture as children literally grow up on the bike and are transported to nursery on the back of theirs mums bike, just as their mum was transported to nursery on her mums bike 30 years ago, and so on. However this would not happen were it not for the safe infrastructure that is provided for them. 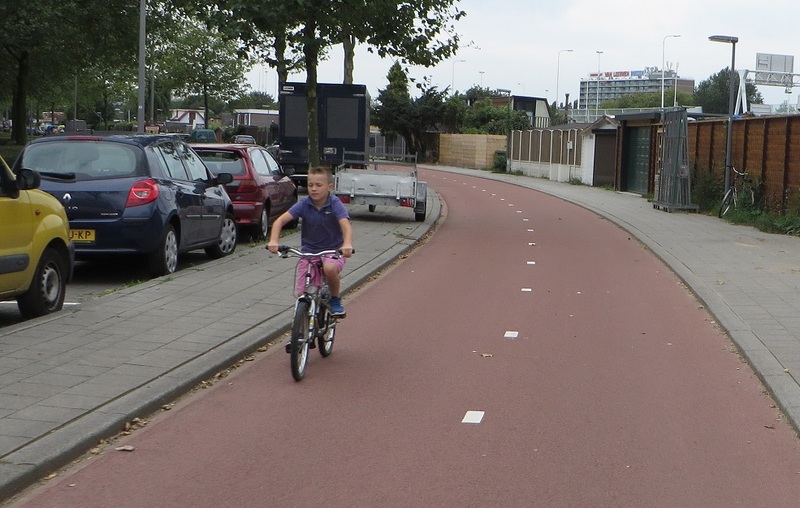 Children cycle alone on main roads in the Netherlands from a very young age and protected cycle infrastructure is of course key to that; put these people in Hackney and they'd be on the bus or car like most people. 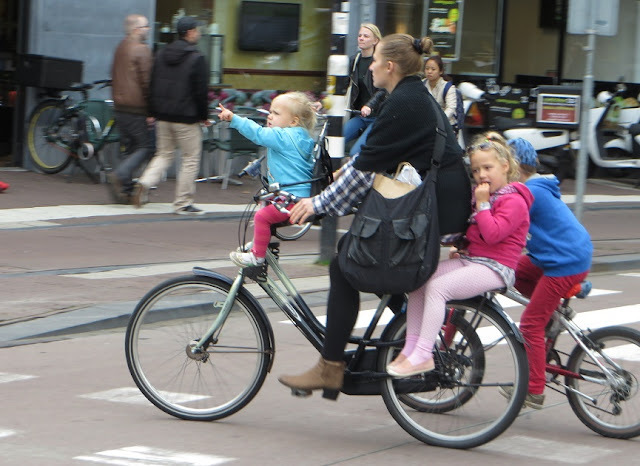 The UK did used to have a "cycling culture" and it wasn't until the 1960's that this stopped being the case. We can bring those days back and create the conditions, just as the Dutch did, where large numbers of people see cycling as a perfectly normal way to get to work, to see friends, run errands and allow their children to cycle independently to school. London is slowly starting to build this infrastructure and some other cities in the UK also seem to be slowly progressing. However it must continue and the next Mayor should be aiming to build cycle tracks on all TFL controlled roads. We should stop building "cycle superhighways" and instead just build cycle tracks on the main roads where lorries and buses run. Local councils should be forced to install cycle infrastructure when they upgrade roads or build new ones. Closures of residential streets should not be classed as "cycling infrastructure" but schemes that benefit the local community as a whole. Highway England, Traffic Wales and Traffic Scotland should begin building high quality cycle infrastructure along the main motorways and Dual Carriageways of the UK. Yes, it will take many years and in some areas sacrifices will have to be made but we have to start somewhere, just as the Dutch did. 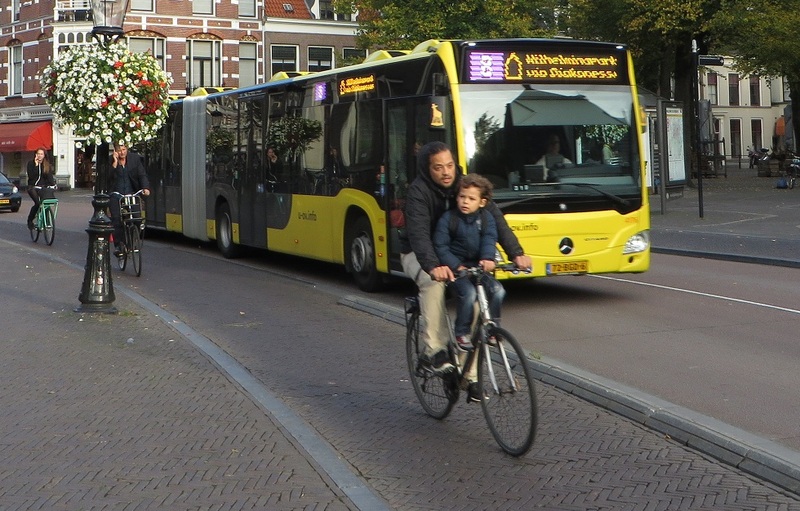 If we were to aim to build the same level of infrastructure that they have in the Netherlands here in the UK then we could also produce a safe cycling culture, safer conditions for pedestrians, quieter and calmer cities, less pollution, faster and more efficient public transport, a healthier nation and plenty of other benefits as well. However without the infrastructure cycling will always be a minority activity.